Why doesn't America's 4.9% unemployment rate feel great? Why doesn't 4.9% unemployment feel great? 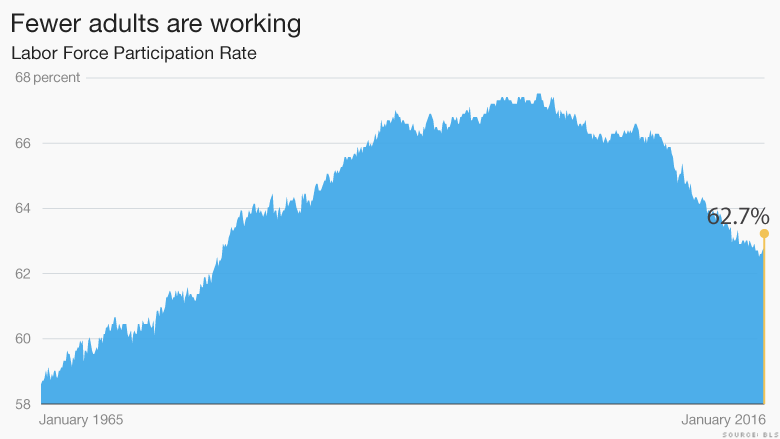 The U.S. unemployment rate just fell below 5% for the first time since 2008. Normally, this would merit a celebration. But these aren't normal times. The economy is better than it was in the Great Recession, but not even President Obama is ready to declare it's booming. In a special speech Friday touting the job gains during his presidency, Obama admitted there's more "to tackle." "We should be proud of the progress we've made...we've recovered from the worst economic crisis since the 1930s," Obama said. He doesn't believe he gets enough credit for creating over 14 million jobs. People as diverse as Democrat Bernie Sanders and Republican Donald Trump don't put it gently. They claim the "real" unemployment rate is much higher. Sanders calls the economy "rigged," and Trump says the U.S. never wins anymore. The political jabs reflect the mood of the nation, even if the allegations aren't fully supported by data. There are three key reasons why everyone from Main Street to Wall Street isn't cheering 4.9% unemployment. Only 62.7% of adult Americans are working. The so-called Labor Force Participation rate hasn't been this low since the late 1970s. The rate measures how many people over age 16 are working or actively seeking work. Back in the '70s, it was low because fewer women worked outside the home. That's not the story today. Now, three factors are driving the decrease in workers. The first is that a huge part of the adult population, Baby Boomers, are retiring. That's expected and healthy. It explains about half of the decline in the workforce. The second is more young people are going to college and graduate school. They are studying more, which should be a positive for the nation. But the third one is alarming: some people have just given up on finding work. It's hard to quantify how many people fall into this dropout category, but it's large enough to matter. Politicians like Trump talk about it in stump speeches. The Wall Street Journal estimates that about 2.6 million of the roughly 92 million American adults who don't work want a job but aren't looking for one. Related: Did President Obama really create 14 million jobs? Another reason why the jobs picture still looks gloomy is that an unusually high number of people can't find jobs even though they have been looking for a long time. About 2.1 million Americans have been unable to get a job for over half a year. The government calls these people the "long-term unemployed." During the worst of the Great Recession, 6.8 million people were long-term unemployed. So there's been improvement, but there are still roughly double the number of long-term unemployed than in normal times. "I don't think we're at normal yet," says Sharon Stark, an investment strategist at D.A. Davidson. "There's still a lack of job security." The last big issue is that wages aren't going up for many Americans. The typical take home pay (often called "median income" by the Census Bureau) is about the same today as it was 20 years ago, once you adjust for inflation. In other words, middle class families aren't really getting ahead. They're just getting by. To be fair, this was a problem even before the Great Recession came along, but experts keep predicting wages will go up and it's not happening. 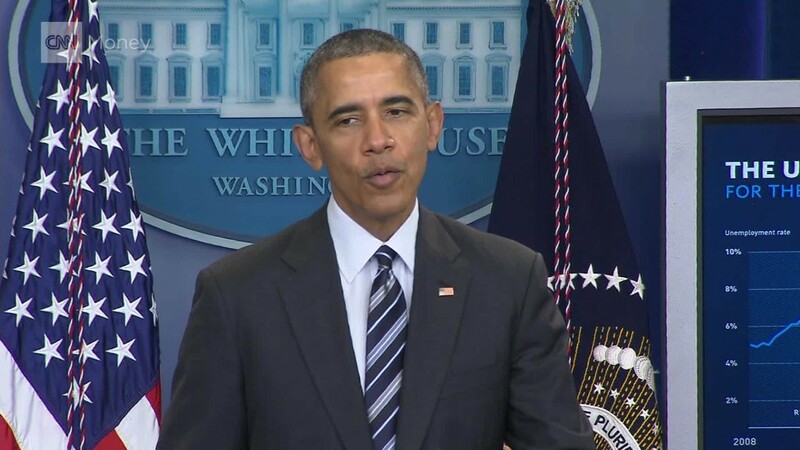 On Friday, Obama tried to celebrate the small gains that have been made in recent months. "This progress is finally starting to translate into bigger paychecks," he said. But the reality is wage growth is only 2.5% a year. As Sharon Stark of D.A. Davidson notes, normally when unemployment is this low, wage growth should be humming along at about 4% a year. "It's a very different environment than it used to be for workers," Stark says. -- Patrick Gillespie contributed to this report.